TRY ME: James Marshall scores Brods' final try against North Ribblesdale. Old Brodleians made it 103 points in two home games so far this season when they sent North Ribblesdale packing by 49-13 in Yorkshire One yesterday. They were 10-3 down after the first quarter before Samoan centre Simanu Tusinga - known simply as Manu - scored two tries and set up another to help Matt Smith’s side into a 23-13 interval lead. Another four tries and three conversions followed down the slope in the second half, although Brods did have one lengthy spell frantically defending their line. 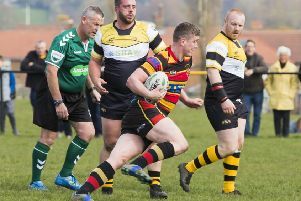 Having put derby rivals Old Crossleyans to the sword in their opener, Brods had disappointed on the second weekend of the season when they failed to get going after the bus ride to Bridlington. They were back on song in glorious sunshine with Manu, fellow backs Dom Georgiou and Tom Andrew and young props Reece Ward and Josh Cricknay particularly impressive. Home full-back Phil Town and Ribblesdale centre Steve Moon traded earlier penalties. The visitors from Settle have a reputation for strong forward play and when they were awarded a penalty try on 16 minutes, after twice marching back Brods in the scrum, the home pack looked to face a difficult afternoon. Moon’s kick made it 10-3 but play was opening up and Brods drew level on 21 minutes when Manu shot through, was hauled down just short of the try line and popped the ball up to Andrew who was backing up superbly. Town converted. Manu is quickly becoming a crowd favourite and he gave Brods a 15-10 lead on 27 minutes from Georgiou’s tap penalty near half-way, handing off an opponent wide on the right. Moon’s 40-metre penalty kept the visitors very much in it but Matthew Hoyle and James Marshall set up Manu to chip the defence, re-gather and swallow dive over in the corner with five minutes of the half remaining. Town kicked a penalty just before the break and then converted lock Lee Scrimshaw’s try six minutes after the restart as the home forwards started to flex their muscles. Trailing 30-13, the visitors battered away at the home line, retaining possession well. Brods eventually lifted the siege and the confident scrum-half Georgiou weaved his way through impressively to end the visitors’ resistance on the hour. The home forwards were now on top in the set piece and their reward came in the shape of a try from South African prop Cricknay with nine minutes left. Replacement Dan Wood converted and completed the scoring after winger Marshall had sped in on the right.